the altitude of residence, the higher the altitude the greater the energy. The principle is that the greater the depth of atmosphere through which the sunlight must travel, the more energy is lost. This is minimised by high altitude and an overhead sun, and there are health benefits from high altitude residence. The other factor is that a hypothetical ray of light from an overhead sun will light a circular spot on the surface of the earth. 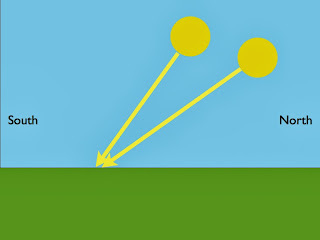 A hypothetical ray from a sun that is low in the sky will cast light on an elongated spot. In other words the energy from the lower sun will be spread over a larger surface area, and so less energy per square metre. Even small increases in altitude are effective in urban areas there is always a layer of polluted atmosphere close to the ground, as can be see in London, England, and Linz, Austria. It is only when above this layer that it can be appreciated. The climate also has an influence on the sun energy that we receive. Cloud cover reduces sunlight penetration, and this is important in the north-western parts of the UK, especially the west of Scotland, where there are serious health problems. Atmospheric pollution also interferes with sunlight penetration, especially particulate pollution from smoke, also known to have a detrimental effects on health. We can see the variation of sunlight over the UK. The variations is hours of sunlight, which in the absence of cloud is the same everywhere. The effect of cloud can be seen in the west of Scotland and north-west England to a lesser extent.The effect on health can also be seen, just in England. 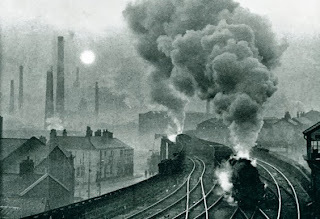 Premature deaths are greater in number in the north-west where there is less sun. 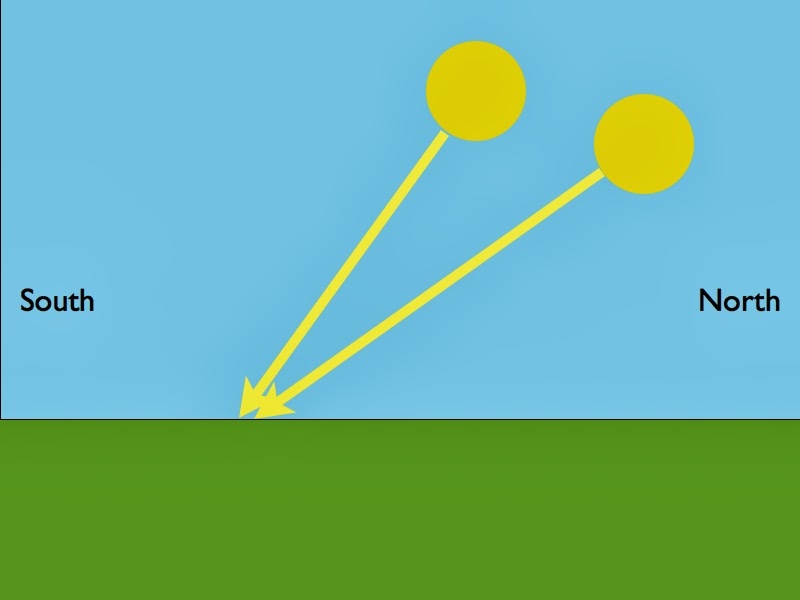 The energy of sunlight at ground level is a a different thing, being greatest closer to the equator and at higher altitudes. The variations can be seen in this comprehensive review, the source of which is "Sustainable Energy without the Hot Air", a remarkable book by David MacKay (available on the internet but also in printed form. You will see that Edinburgh is the city second only to Anchorage, Alaska, for the least sunlight energy at ground level. Not very good for solar energy and not good for health. Glasgow probably has less sun energy. North west European cities are low in sun energy. They are are habitable only because they are kept warm by the Gulf Stream, bringing warm water from the tropics. Edinburgh is further north than anywhere in China. It is the same latitude as Siberia and Hudson Bay. Variations of human behaviour also influence our exposure to the sun. Clothing is most obvious and those who extensively cover their skin with clothing, usually for religious reasons with the examples of Jews and Muslims. There is also the amount of time spent out of doors and these days there are fewer outdoor workers. In hot countries indoor air conditioning is very tempting. And of course the use of sun-block creams prevents vitamin D synthesis in the skin. One way to deal with this has been Sunshine Clinics, where children have been exposed to the ultra-violet light of which they have been deficient. 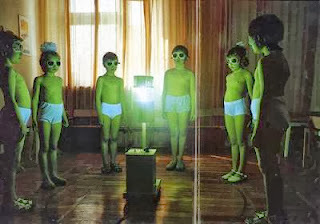 The present-day equivalent are sun-beds, but children are not allowed it use them. They are generally frowned upon by the misguided "sun cancer police". However regular sun-bed users have excellent blood levels of vitamin D.
There are people who have traditionally lived in northern latitudes with little sun, particularly Inuits of northern Canada and those of the coastal communities in Scotland and northern Scandinavia. They have been surrounded by seas teeming with fish, by good chance an excellent source of vitamin D. Their health deteriorated when fish became a much smaller part of their diets, the result of “modernisation” and movements of the village populations to cities. Because of little sun and in many places less fish, vitamin D deficiency is very common at present, and it is appreciated that a supplement taken by mouth is often necessary. The need for this can be seen from testing the blood level. Vitamin D is continually being consumed by body metabolism, especially inactivation of its active form to prevent excess levels. The amount required is to match the amount consumed and this appears to be about 2,500 units per day. As vitamin D is absorbed and stored in body fat it can be taken in larger doses at longer intervals. Perhaps the most convenient is a weekly dose of 20,000 units. An EU report of 2002 (no longer on the EU website) and a more recent eastern European report both recommended 2,000 – 2500 units per day. More cautious advice is 10,000 units each week rather than 20,000 units. The use of “units” goes back to the time when vitamin D itself could not be measured chemically. Its activity was measured by its ability to heal rickets in young rats bred to be vitamin D deficient. It might have been that one unit per day was that which would heal rickets in a young vitamin D deficient rat. 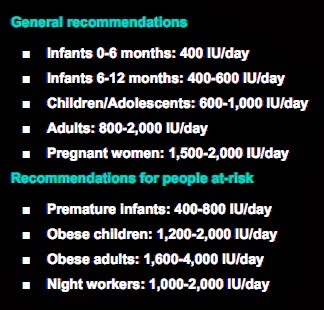 Today we can measure vitamin D but the use of “units” tends to persist. One microgram of vitamin D is equivalent to 40 units. 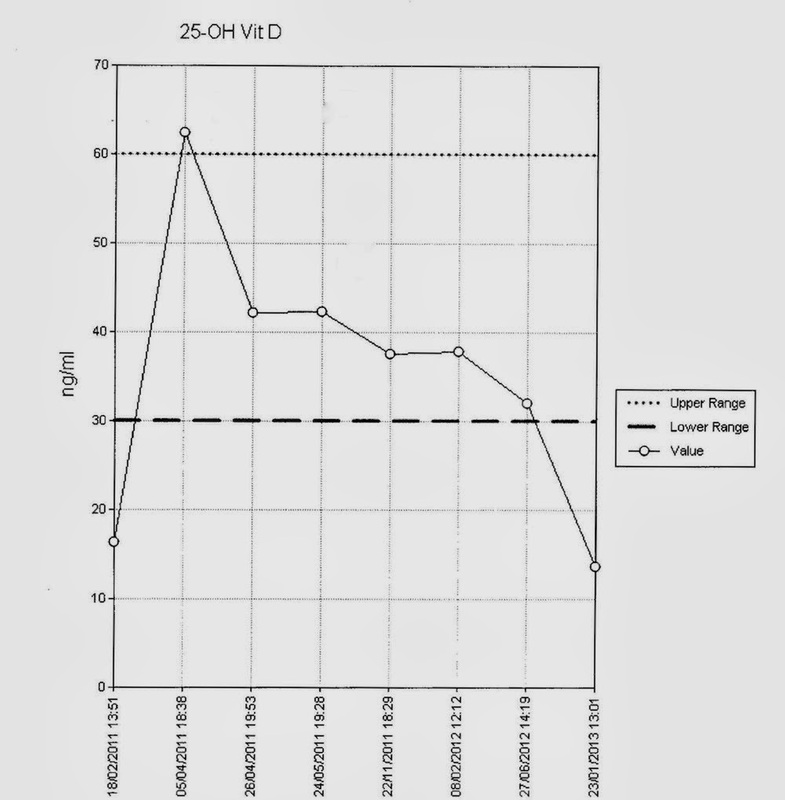 If blood levels of vitamin D are particularly low, less than 10 ng/ml (25 mol/L), then it is usual to give initially a higher dose of 20,000 units daily for two weeks so as to correct the deficiency rapidly, and then to reduce to 20,000 units weekly for long-term maintenance. 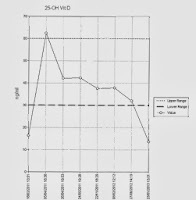 The higher range of the dose stated is the most effective. 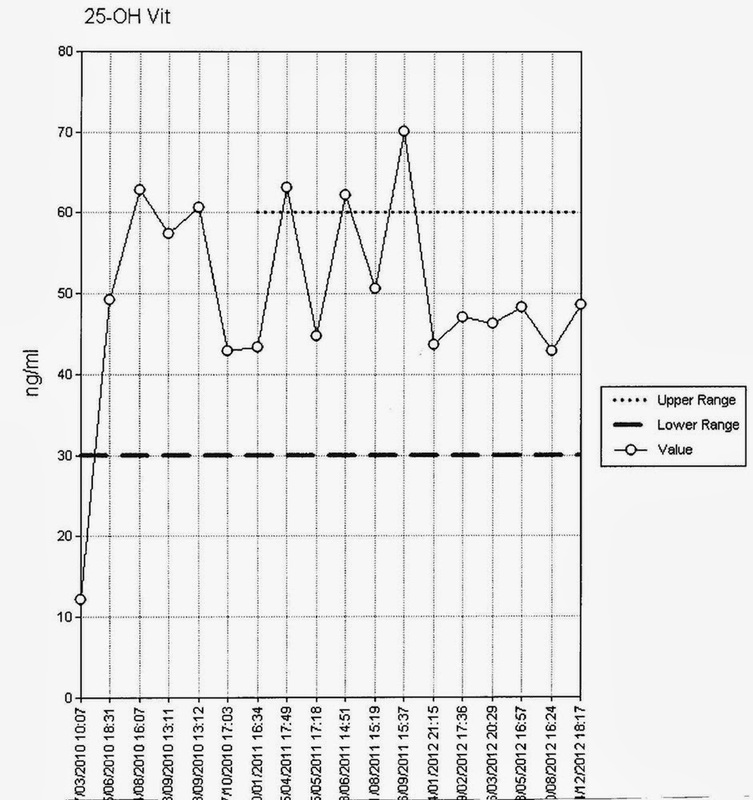 We can see some graphs illustrating serial blood levels when treatment is given. 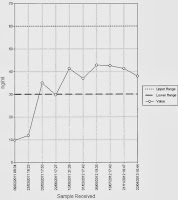 These serial tests are not necessary in usual life or clinical practice but they have been part of gaining experience in the use of vitamin D.
You will see that after an initial high daily dose to correct the deficiency a steady state is reached. This can now be seen to be predictable, thereby removing this need for frequent measurements of blood level. We can also see that if vitamin D supplement is stopped when a good blood level is achieved, then the blood level drops back to its natural level. The natural level of an individual level is a reflection and a result of the individual's lifestyle and place of residence. In young people in particular it can be a result of inheritance, inadequate transfer of vitamin D across the placenta before birth. The natural variation throughout the year is lost when the supplement continues throughout the year but this is not a problem. It is better to avoid the winter dip of vitamin D levels, which are associated with more illness in the winter than in the summer. The action of the sun on the skin will inactivate any excess of vitamin D that might occur in the summer. 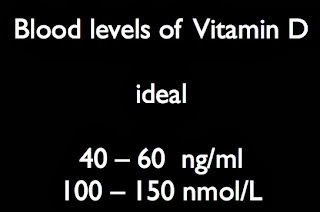 Taking vitamin D 20,000 units (= 500 micrograms) per week produces an excellent blood level without any excess. This can be seen in the results of 172 people receiving this supplement. Each vertical line represents one person. The blue represents the pre-treatment natural level. You will see that about half of these had a blood level of less than 10 ng/ml, very low levels, representing their residence in the north-west of England, many (but minority) of South Asian ethnicity. 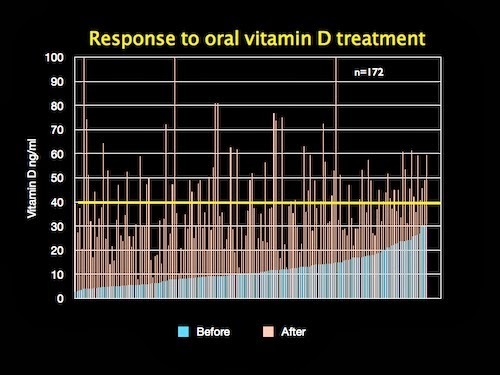 The adjacent pink line represents the blood level of vitamin D achieved after taking the supplement for three months. 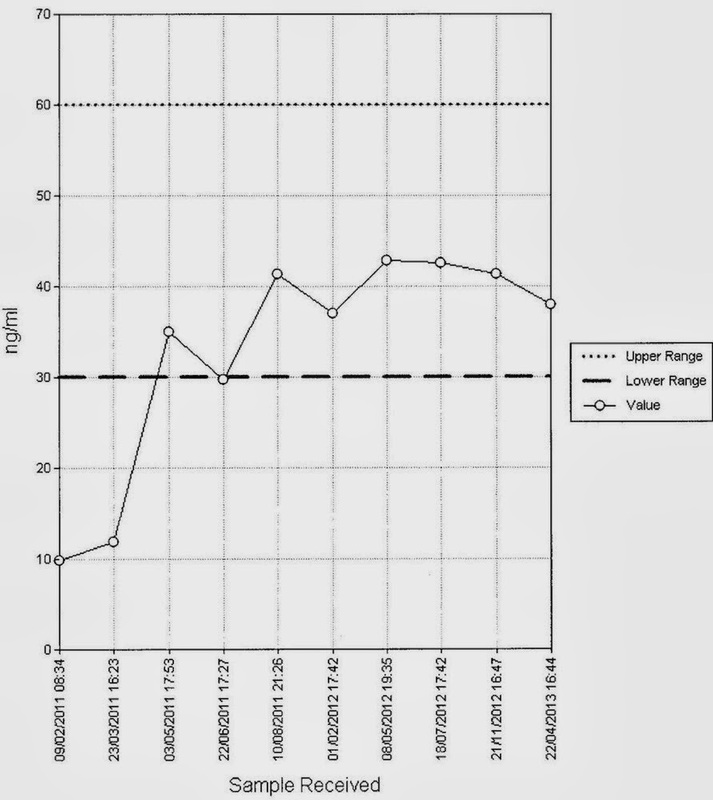 The response is good and only two reached a blood level of marginally greater than 100 ng/100ml (250 ng/L), a level that is not dangerous but greater than necessary by present understanding. 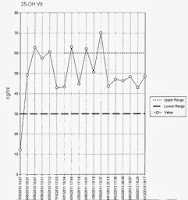 There is a variation in response as shown by the blood levels in people receiving the same supplement, although it cannot be assumed that all took what they were prescribed. Biological variation can be due to a genetic variation of VDP – Vitamin D Binding Protein. A fat soluble substance like vitamin D will not dissolve in an aqueous medium such as the blood plasma and it must carried attached to a protein. This is a general principle and it applies to virtually all medicines. Vitamin D requires a specific protein, similar to thyroid hormone that requires specific thyroid binding globulin (TBG). These proteins are synthesised by genetically controlled metabolic processes. What it means is that when we measure the blood level of vitamin D, that is just what we are measuring. Strictly speaking we are not measuring whether there is real deficiency of vitamin D but it is the best measure that we have. 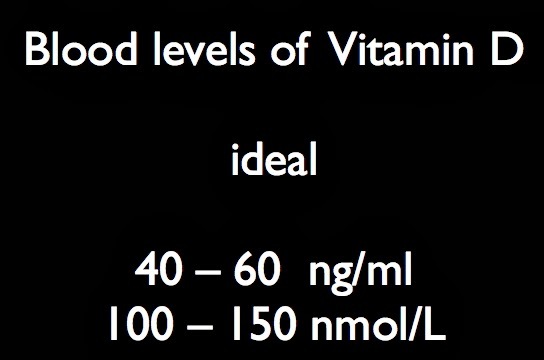 VDP deficiency, like all genetic abnormalities, is rare and low blood levels of vitamin D should be corrected. The expected target range might not be reached for above reason. If the blood level of vitamin D is measured before starting a supplement then it is reasonable but not essential to repeat the test after three or six months. Do not be concerned if the blood level is not well into the ideal range 40–60 ng/ml (100–150 mol/L) as the important thing is that the correct supplement is being taken. There are many vitamin D supplements. The most convenient and effective is the 10,000 unit capsule, taking one or two each week, as a long term supplement.